2. They also want to reach new audiences. They want that content to spread from their core audience to new potential customers. One of the most effective ways to achieve both goals simultaneously has sprung up recently in the form of memes. Memes are easily recognizable visual gags that are customized and shared online. If you remember the Distracted Boyfriend or Grumpy Cat or the Success Kid baby pumping his fist, you’ll know exactly what I mean. The images are funny and anyone can crack their own joke by adding to the text. The meme becomes the center of an international conversation, like people sitting on a giant, global sofa, getting laughs by riffing off each other’s jokes. How can memes be used in marketing? The power of those memes to reach millions, to stick in people’s minds, and to engage them actively is a huge opportunity for brands. A business that can put its brand at the center of the conversation around a trending meme can generate millions of dollars’ worth of free reach. It’s no surprise that big brands have hired savvy social media experts to generate applicable memes. Netflix, for example, has it easy. The company has access to massive amounts of visual content that it can use to create shareable memes of its own, and it does so. But those memes are often less effective than the images created by the company’s customers which it then shares. In principle, anyone who creates those memes breaches Netflix’s copyright. But Netflix certainly doesn’t care. It’s getting free publicity and an army of smart, witty people creating marketing content for nothing. Few companies have a library of visual content as rich as Netflix’s but it’s also possible to create your own focus for memes. When the Philadelphia Flyers rolled out Grittyas their new mascot, they might not have intended to create a meme theme but that was the result. The orange, dumpy monster quickly appeared in a host of memes created and shared by fans, and even by people who couldn’t tell one end of a hockey stick from the other. Each time Gritty appeared in a meme, the brand image spread further across the Internet. It’s not an easy model to copy. But it’s not impossible. There’s no reason that other businesses can’t have mascots, cute logos, or any other image that people might want to share. The problem, of course, is that memes are never entirely in the control of the brand. Once you hand over an image to audiences, there’s no knowing how it will end up or how people will use it. 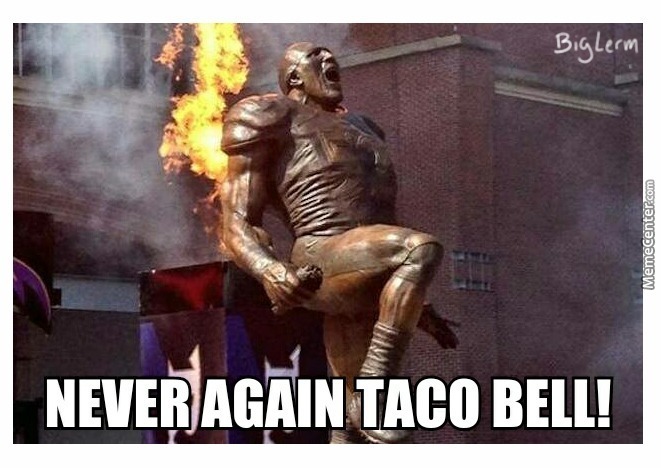 Taco Bell has worked hard at using memes as part of its advertising campaign, even putting meme-style ads on billboards. But those fake memes always came across as a bit cheesy while the audience-generated memes about the “explosive” power of a Taco Bell meal were much wittier. They might have put the brand’s name in front of far more people, but sometimes it’s just not true that all publicity is good publicity. How can I leverage memes for my own small business? If you’re looking to create your own meme, pick a visual gag that your audience can relate to. Tie that gag to some element of your brand: its sassy attitude, for example, or its laid-back coolness. Seed your social media platforms with your content and hope that it takes off. And bear in mind that if it does, whatever happens next is out of your hands.